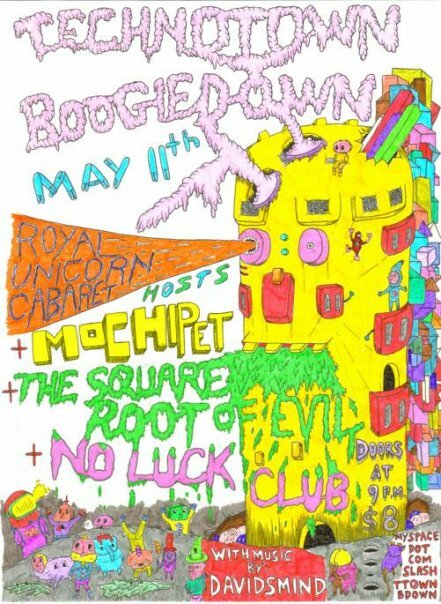 May 6, 2008 - shows!!!!! I have some shows coming up! 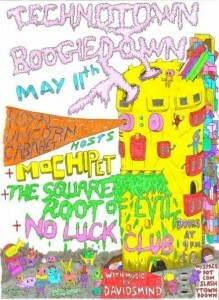 This Sunday, May 11, I am playing with The No Luck Club and Mochipet! I will start out with some thumps and ends with some rushes. I have a bit of new stuff that is fast & furious, so that will work nicely. I love playing at the Royal Unicorn, I just wish they would fix the disco floor. Then on June 3rd I am playing with Venetian Snares (!!! ), Taal Mala, Colby Sparks, Hunter Green and the Goblin Queen. This is terribly exciting. I have a new laptop too, although my shows in Europa went off, I was having some minor technical difficulties that I believe can be traced to a dying hd on my trusty powerbook. Yes, I could just buy a new hd, but it was getting a bit old so now I have a new one that can run up to date version of software! w00t! So come watch me spill some beer on it!